Remember a sweaty Steve Ballmer jumping up and down shouting "Developers! Developers! Developers!" at a Windows conference? The reason he was quite so sweaty? He was running a 100 degree fever but refused to skip a scheduled appearance. When Steve Ballmer bounced onto a stage proclaiming "I love this company," he meant it. He was never afraid to show his enthusiasm, whether it was making a comedy video with Bill Gates or relieving his frustrations at losing key employees to the competition by tossing around the office furniture. He routinely gave out his email address, and if you fired off an email to Ballmer, you could easily tell if you'd got a response directly from him or from one of his assistants. Authentic replies were short to the point of being abrupt. Perfect spelling and complete sentences were a dead giveaway that he'd handed it over to someone else to deal with. When Microsoft set up a "buddy program" to connect partner companies with someone on the inside to help them navigate the complexities of the company, Ballmer insisted on putting his name in the hat - and some company got a tireless advocate on the other end of the phone. Ballmer went to a friend's wedding and promised to fix their computer. After spending the weekend working on it, he flew back with the XP-era desktop PC in his carry on, carried it into work, and dumped it on the desk of then Windows head Jim Allchin with instructions to fix it. Allchin called it a humbling experience: "That machine was so owned, it was unbelievable." The same enthusiasm led to unfortunate statements, like telling the press most music on iPods was stolen (true but nobody wants to hear it) and calling Linux a "cancer … in an intellectual property sense". Again, that's an accurate description of the viral nature of open source licences like the GPL, but it's a typical ballsy Ballmerish way of putting it. He had a phenomenal grasp of sales and operations and he had key figures on the tip of his tongue, but often what people saw was a sales guy full of gusto pretending to smash an employee's iPhone. His sense of humour didn't often show in public. Practising for a keynote where Microsoft would show Linux running in a virtual machine for the first time, shortly after he had a health scare, the techie running the demo launched not one but dozens of Linux windows, popping up all over the screen. 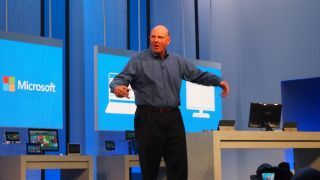 In mock horror Ballmer is said to have clutched his chest and staggered across the stage. Concerned staff rushed towards him, only to see him stagger the other way, gasping for breath. Eventually they caught up, only to find him breathless with laughter at the joke. Calling his tenure at Microsoft a disaster fundamentally misunderstands the challenges Microsoft faces, and the wider economic situation. You can refer to the stock price as stagnant - or you can look at it the context of credit crunches and recessions, starting with the dotcom crash that happened just a few months after he took over in 2000 and the DoJ lawsuit against the company, and view it of something as an achievement to keep it flat in the face of a stock market that took the steady stream of profits for granted. Despite all the complaints, Ballmer doubled profits and almost tripled revenue (from US$25 to US$70 billion a year) while running Microsoft. Exchange, SQL Server, System Center, Visual Studio, Windows Server, Hyper-V, Office – from the landmark 2003 release to Office 365, Xbox, Windows Phone, Windows 7, Lync, Azure, SkyDrive, acquisitions like Perceptive Pixel and Skype and Yammer: those are all successes that happened under Ballmer, many of them billion dollar businesses. Skype seemed pricey at $8.5 billion for a company with $800 million in sales, but that's now up to US$2 billion this year. Under Bill Gates, despite his famous involvement in every project (he participated in every product review), Microsoft wasn't exactly focused. If the much-vaunted Courier project had shipped, that would have made something like five platforms competing with Windows - Windows CE, Windows Mobile, Xbox, the Media Room IPTV system Microsoft recently sold, and all the different flavours of Windows Embedded.